How do I order School Photographs (prior to School Photo Day)? We recommend ordering online. When ordering online, envelopes and money do not have to be returned to your school, which is the preference of most schools. To order online you will need to enter the 9 digit advancedorder code issued exclusively to your school. The 9 digit advancedorder code can be found on the top right-hand corner of the ordering envelope or online flyer available from your school. If you have misplaced or you did not receive a flyer, the easiest way to obtain your school's advancedorder code is to ask a friend or classmate, as this code is shared by your school. If this is not possible, please contact your school office - for security reasons only your school can distribute the advancedorder code to the school community. 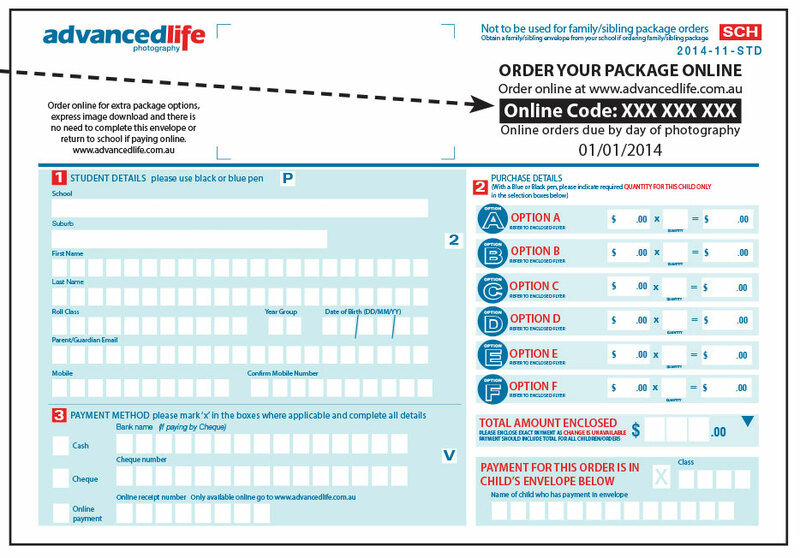 Once you have the advancedorder code, visit www.advancedlife.com.au and enter your code. If you prefer not to order online, please complete all the details on the order envelope supplied and return the envelope to your school on photo day. Cash or cheque orders cannot be returned to the school after the day of photography. 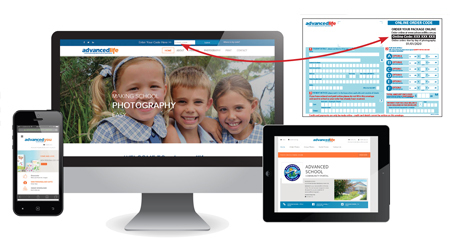 All orders placed after the Main Day of Photography at your school must be made online. To order online you will need to enter the 9 digit advancedorder code issued to your school. The 9 digit advancedorder code can be found on the top right-hand corner of the ordering envelope available from your school. Orders can be made for up to a week after the main day of photography, at regular pricing. After the week, all orders are closed and the order will incur a reorder fee. This fee cannot be waived. I ordered online. Do I have to return an envelope? If you have ordered online, you do not have to return an envelope. As photo package orders are usually distributed by the school to the student photographed, this may cause delivery problems when a child divides their time between parental residences. If you would like to collect your order from the school office, because you anticipate this may be an issue, please place your order online prior to the day of photography and check the appropriate collect your package check box. This will separate your order from the regular distribution and give you the opportunity to collect your package directly from the school. If your school permits sibling photographs to be taken (most commonly in Primary Schools), you can only place an order prior to the main day of photography. These photographs are taken by request - if there is no order we will not know to take the Sibling Photograph of your children on the day. To order online you will need to enter the 9 Digit Online Community Code issued to your school. The 9 Digit Online Community Code can be found on the top right-hand corner of the ordering envelope or online flyer available from your school. Online ordering for Sibling Photographs closes 12-48 hrs before the main day of photography. To ensure your online sibling order is processed, please complete payment at least 48hrs before your school's main photo day. 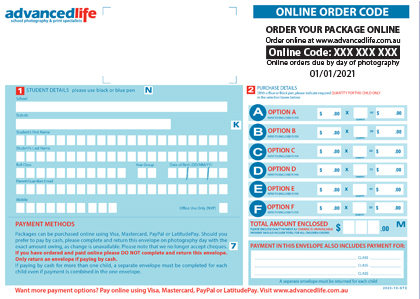 advancedlife does not accept orders over the phone, and cannot record or accept credit information provided manually or verbally. For the security of our customers, all credit card and B-Pay transactions can only be made by customers using our secure websites. 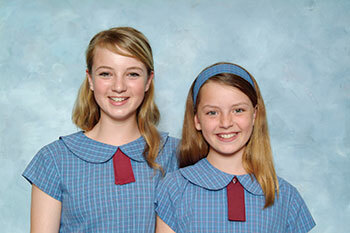 Sibling photos can be ordered online, using the school's unique 9 digit advancedorder code. However, orders can only be placed for sibling photos up until 48 hours before photos are due to be taken at your school. Sibling photo orders cut off prior to other school photos, due to the need for us to supply a list of siblings to be photographed to our photographic team, to ensure all siblings are photographed on the day.